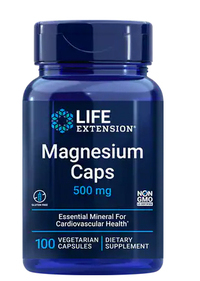 Magnesium - 500 mg, 100 vegetarian capsules (Life Extension) - Penn Herb Co. Ltd.
Magnesium helps maintain normal muscle and nerve function, keeps heart rhythm steady, promotes healthy cardiovascular function, supports a healthy immune system, and keeps bones strong. Magnesium also helps maintain blood sugar and blood pressure levels already within normal range, and it is known to be involved in energy metabolism and protein synthesis. Since magnesium is so inexpensive, everyone should consider supplementing with at least 500 mg of magnesium daily. Helps maintain normal muscle and nerve function; a major factor in relaxing the smooth muscles within the blood vessels; promotes healthy cardiovascular function. Take one capsule 1-3 times daily with or without food, or as recommended by a healthcare practitioner. CAUTION: If taken in high doses, magnesium may have a laxative effect. If this occurs, divide dosing, reduce intake, or discontinue product.